Trained as graphic designer, Roel works as an independent conditional designer / director in the field of interaction, media design and film. His work often reflects on the systems or technology we use in our daily lives. Sometimes by deconstructing or changing fundamental parts of existing systems, sometimes by designing new ones to see what happens when people are using them. 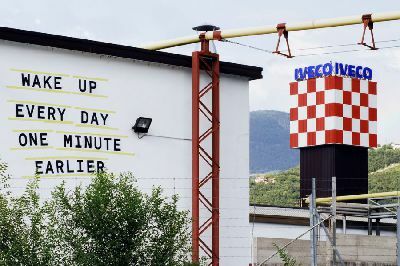 He applies this approach to all kinds of media: dynamic media (web, tools, animation and video) but also to print, installations and performances. 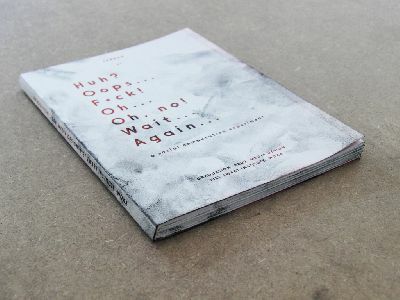 Together with Luna Maurer, Jonathan Puckey and Edo Paulus he has authored the Conditional Design Manifesto, a manifesto that promotes the idea of designing conditions rather than end results. 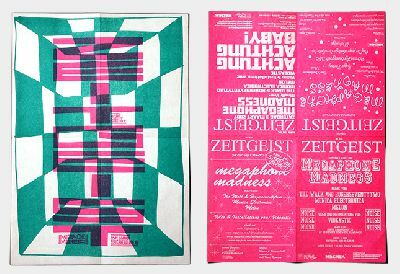 For the past few years he has been teaching interactive and graphic design courses at the Gerrit Rietveld Academy, the Sandberg Institute, Yale University School of Art and the Piet Zwart Institute. His work has been exhibited and screened all over the world e.g. at the Stedelijk Museum Amsterdam, Museum fur Gestaltung Zurich, Britsh Film Institute, Sundance Film Festival. Roel likes to collaborate. Roel won several national, and international awards. 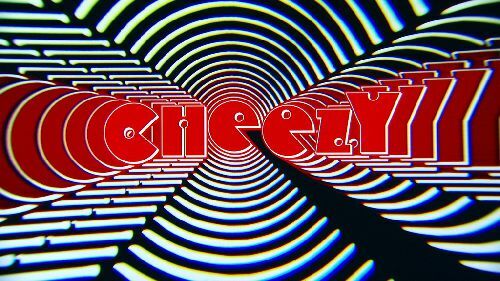 Title sequence for children television series "Doctor Cheezy" by VPRO / Pupkin. The type animation is a feedback loop. A camera is filming a screen that is showing the output of the camera. 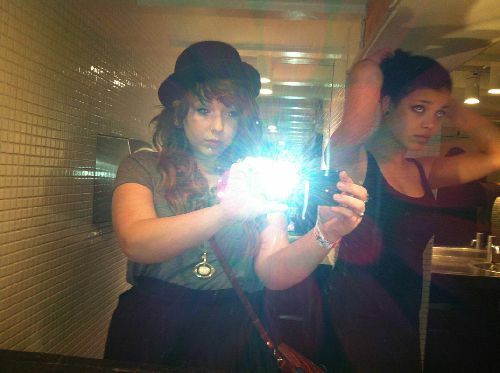 Basically its an homage to the ultimate amateur photo - a self portrait in the mirror with the flashlight switched on. We build an iPhone 4 app that collects these photos and puts them in specific order to generate animations. Once you have installed the app on yor iPhone you can browse the Flitser collection by swiping with your finger over the screen or create an animation by tossing the flash with your finger. Take part in building the Flitser collection by contributing your own flash photo. All you need to do is take a photo of yourself in the mirror, with the flash of your iPhone inside the target location that we provide you. Conditional Design, 9-12 Sept 2010. The 1200 m² on the 4th floor of the SBP-building acted as the surface of our playing field. The Court-Line™ Tape Machine served as our pen. Visitors received round stickers. 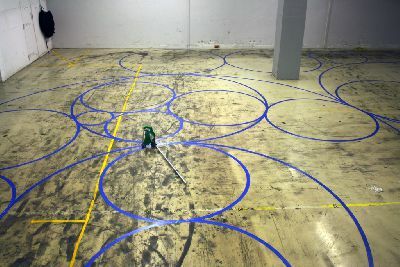 Together with the visitors we generated the circular pattern on the floor during the four days of the festival. We and the visitors were bound to certain rules. 2. Place your sticker at the end of the snake on the blue circle line. 3. On a junction, choose the path that has the best prospectus. Pssst! The snake may not eat its own tail. Provide a path for the snake. 2. Use green tape to mark the center of the circles. 3. Each new circle should touch the former circle but may not include the center point of another circle. We were fascinated by the abstract beauty of lines on the gym floor. Usually these lines define the boundaries of the playing field. We designed a game that creates its boundaries through playing. The visitors were invited to play with us but they had an absolute minimum amount of freedom. They had to make a snake with stickers as long as possible. Only a few of them were able to change the direction of the snake: once they encountered a junction. Sometimes one was responsible for the crucial decision that could have ended it. Most of the visitors were only able to feed the snake. We developed a method for giving directing instructions over the web. Everybody who has a a webcam and feels like it can contribute. Here, here and here are 3 examples of how we give directing instructions but of course you can only know what we are talking about when you add a scene yourself. KORT! is an initiative of NTR in collaboration with the The Netherlands Film Fund, the Dutch Cultural Media Fund, CoBoFonds for young screenwriters and filmmakers to make short films. 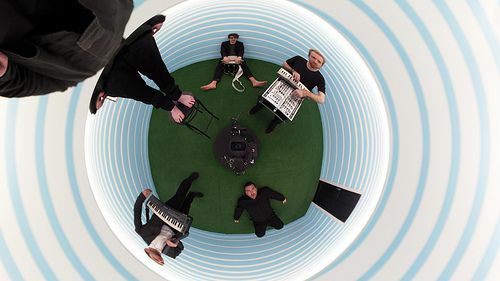 From the original treatment: "Hot Chip have created a machine that transforms a small room into a planet - a mini utopia. 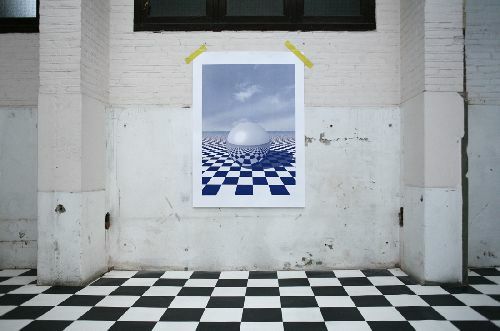 A small studio is converted into a space with the appearance of a planet by painting the walls, floor and ceiling A camera on the floor is shooting a movable silver sphere attached to the ceiling and the reflections that appear in it. ", "The silver ball is hanging from the ceiling and can be lowered mechanically with a remote control. ", "The sphere moves down and the floor camera zooms out simultaneously, capturing the transformation. Dolly zoom effect"
About half of the video is shot with a handycam by the bandmembers themselves. Since the set was completely closed from all sides it was hard to give them directions. Which allowed for unpredictable personal shots. The video was presented in the British Film Institute during BUG. An invitation for the program called Lost & Found. Roel used the invitation to show the qualities of a lost (and found) reproduction technique named Stencil. The front depicts the ISO 12233 map for measuring resolution. on the back he tried to show the fantastic colouring qualities stencil can have. During the introduction of the evening a 20 min film of the stencil process was shown. In 2010 we made this crowdsourced video for the Dutch formation C-Mon & Kypski. The project is still running visit oneframeoffame.com to add your frame. Trough the democratization of media we see a change in the relationship between artists and their fans. The Internet has shifted the balance of power within the music industry. The gap between fan and artist is becoming smaller and smaller. Fans always expect to be kept informed of every detail in the life of the artist. Real fans want to be a direct reflection of their favorite artist. Nowadays a fan is able to put his or her version of a video in direct competition with the original. This new democratic order is often beneficial for both. In this project we thematise the diminished distance between fan and artist. We invite the fans to insert their version of video directyly in the original for the duration of one frame. The orginal and the copy become one. First we shot and edited a blueprint video. Then the thousands of frames are copied one by one by the fans, and eventually more than 40% of the frames of the original are replaced. Each fan gets served a frame which he or she has to imitate with the use of their webcam. Rendered back in the video we finally get a fluid body comprising out of thousands of fans. Within this idea C-Mon & Kypski turn into a kind of puppet masters. In the video they discover that the fans are mimicing their poses. Although they never expected that they could control people, the lure of this power is too great not to play with. Eventually the balance of power shifts and the fans take over control. 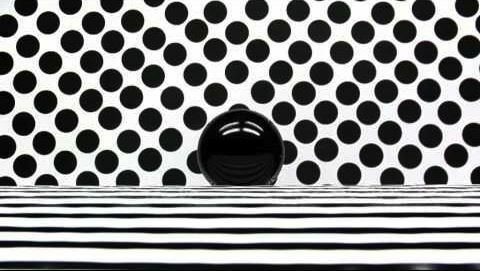 The video won a Dutch Design Award and was nominated for a British Music Video Award. 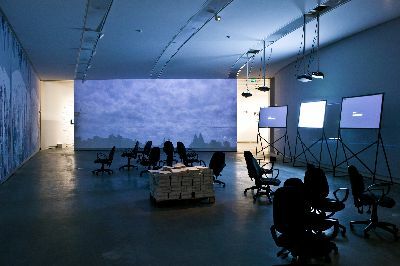 A video installation for an exhibition called PLAY4 at the Van Abbe Museum 2011. The Idea of the exhibition was to confront visitors with the roles we all play when we visit a museum. The museum defined 3 roles which are randomly assigned to the visitor - The tourist, the Pilgrim and the Flaneur. 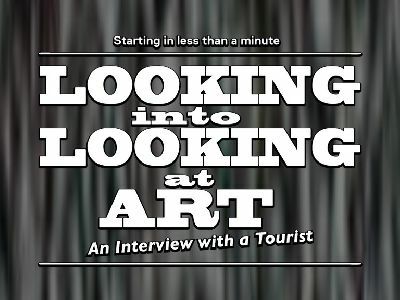 In the installation the visitor is interviewed in his newly assigned role. Looking for experience and contact with authenticity – the real lives and cultures of other people. Wants to see the complete exhibition, Really enjoys to see famous works in reality. Looking at people and the environment without an aim in mind. Everything (art, the building, the visitors) are material for observation. You could say there is a constant play created in real time in the mind of the flaneur out of what he/she sees. Looking for transcendence according to an existing pattern. Is familiar with the oeuvre of an artist and wants to deepen this. 'Believes' in art and is looking for that belief to be strengthened. Going through a ritual. 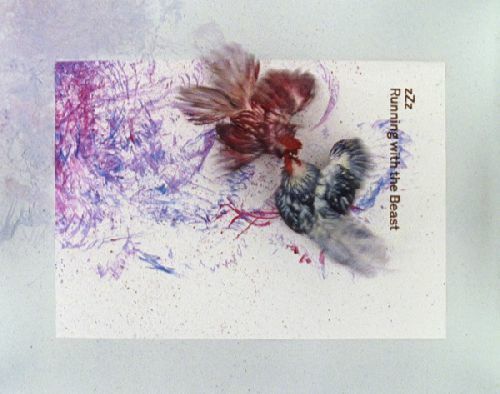 The film features two artists who are trying to capture rage with 2 coloured roosters as living brushes. 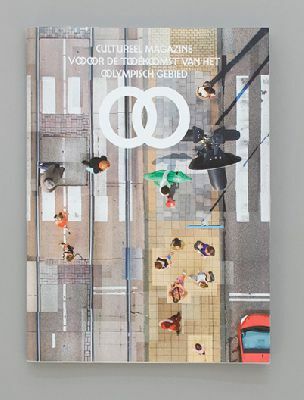 A still of the film is used on the cover of the book film³ It's an interesting book about young dutch filmmakers including an interview with Roel. From the back cover: "...film³ documents the search their work emerges from, traces their motivations, their struggles and succeses." Running with the Beast won an Early Birds Award at the first International Film Festival in Breda. Cast: Bjorn Ottenheim, Daan Schinkel | Producer: Ivo de Jongh, Jack Kuiper | Executive Producer: Vargo Bawits | Director: Roel Wouters | Editing: Jurriaan van Nimwegen | Grading: Jack Kuiper | Director of Photography: Sal Kroonenberg | Concept: Roel Wouters | Line Producer: Apple Puttitanasuntorn | Production Manager: Sun Junpo | 1st AD: Pongdhorn Panichob | Art Director: Noppadol Arkart | Animal Handler: Santisak Dulayapitak | Focus Puller: Jeerasak Intasa | Clapper/Loader: Chanate Intarachub | VDO Man: Sittichoke Sangpatoom | Gaffer: Santi Luprasong | Head Electrician: Chuchat Konchom | Key Grips: Pichet Youngthito | Camera Equipment: Gear Head Co., Ltd. | Lighting & Grips Equipment: Cinerent (Thailand) Co., Ltd. Laptop Reflections is an installation developed for the exhibition INFODECODATA, at the Graphic Design Museum Breda, Feb - Aug 2010. 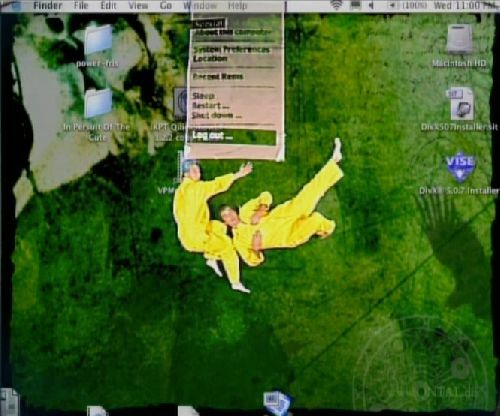 We created a tool that, whenever we were using our laptops, took our portraits via the webcam and screenshots of our desktops. This happened automatically every 5 minutes during one year. The Laptop Reflections exhibition visualized this collection in different ways: an installation consisting of 5 videos, each lasting 3 hours 27 mins, a wall print, a newspaper and the website laptopreflections.org . The images used span the period from 1 April to 16 December 2009. I am being watched. The gaze comes through the laptop screen, focusing on what is happening on the other side. It sees a picture of a face being formed behind the screen. An open mouth, a laugh, eyes screwed up, sleepy, concentrating hard, irritation and anxiety, teeth, nostrils, bags under the eyes, wrinkles on the forehead, minimal differences in an unchanging gaze. I never look my best, like I really want to have my portrait done. The screen sees me the whole time while I am looking at it, I am not embarrassed by it, it is neutral, invisible even, I don’t register its existence, it is just a glowing surface. The screen is inextricably connected to my life. It is a door that I pull shut behind me, which gives me access to a space where I can disappear. It is my gateway to information, it is my space for communication, it is a space where I carry out my work and enjoy myself. I entered into this connection and I am addicted to it. I seek it out, at all times of the day. I am no longer surprised by this phenomenon, instead I invite it into my daily life. The screen travels with me to the most diverse locations in the world, it is opened and closed, once a day, ten times a day, or sometimes it stays on. Even if the journey that takes place in my head while I sit and watch, read, write or research is an eventful one, I might actually be sitting there motionless for hours on end. The images analyse my individual codes of behaviour and my characteristics. It is not just my facial expression that is being observed, but also the context in which it occurs: how is my hair sitting today, how am I holding my body, which clothes am I wearing (again), which other people, friends, supporters, students are hiding behind my screen? In what surroundings have I opened my screen? And the gaze keeps storing the image – every five minutes – in its memory. The gaze is not only directed at me, but also at what exactly I am doing onscreen. Am I emailing or on Skype, am I looking for distraction, do I change application frequently – or even do I swap between active windows frequently? Is it text, images, video or sound that accompanies me throughout the day? Does my portrait match what is happening onscreen? If I am watching a film, does my expression fit the images in the film? Are there big differences between the four of us? We can only discover the patterns and details when the enormous number of images are arranged and displayed in an accessible manner. We captured the images for a whole year, starting in January 2009. Every five minutes during the day a portrait was taken by the built-in webcam and a screenshot taken, whenever we were using our laptops. The gaze was inescapable. To an extent we got used to this gaze that we had turned upon ourselves. However we often felt we were on show and under observation. Sometimes we were followed by the feeling of being watched at times where there was no computer screen nearby, for example while watching television. 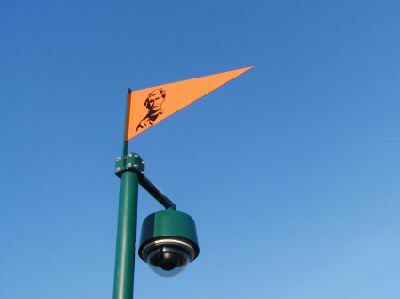 It even happened when we were looking at shop windows or a magazine: suddenly you were overcome by the oppressive feeling that we got when the green light next to the webcam flashed, as a sign that it was storing yet another image in its huge memory. We came to terms with it. The desire to discover patterns was greater than the inconvenience of the gaze. We also enjoyed the experiment, studying your self -portrait is fascinating. The sometimes claustrophobic feeling, the confrontation with our own daily routine alternated with the pleasure of knowing we have been recorded and being able to observe ourselves. We are thus more concerned with personal, subjective, even sensitive feelings: layers which will reveal themselves beyond the objective and concrete facts in the large number of images. We are looking for extraordinary connections and unpredictable arrangements, for series of images that no-one would put together. We made the whole video in one day. The music was recorded the same night. We should do this more often! Respect to Daniel Tagno who independently invented a similar tool in 2008. 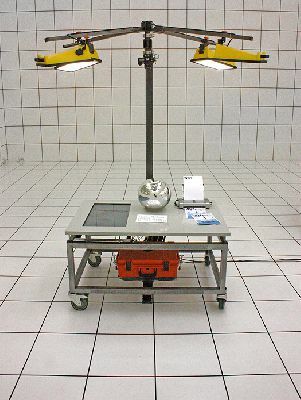 The WEX Machine is a table that is photographed from top every 5 min. The photograph is automatically published on the front page of W139. This allows visitors and staff members from the W139 to easily and instantly publish their thoughts, wishes or announcements to the web. The WEX is dressed with a touch screen to access the W139's archive, a silver sphere to peek inside the gallery space and a printer that allows online visitors to upload images, artworks or thoughts to the physical gallery space. The WEX'S name is a combination of the words W139 and EXtender. We also like the link with the memex a hypothetical proto-hypertext system that Vannevar Bush described in 1945. In collaboration with Erik Borra . 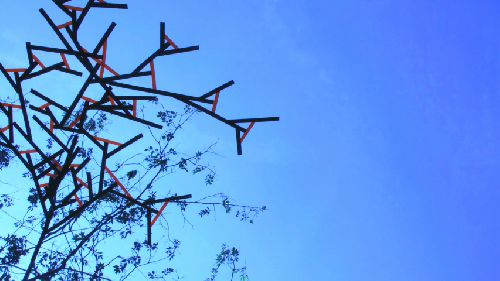 The WEX Machine is a project by Roel Wouters & Erik Borra, produced by Vincent Lindeboom. Developed together with the staff members of W139 and Rene Bakker. Thanks to Hidde Meulenbeek for GUI detailing and graphic design assistance, Van Tetterode Glasobjekten, Daan Meijer. Thank you! Florian Cramer for your words at the opening. The video was shot in a single take in an abandoned warehouse. Robot High School allegorically questions what happens when our perspective and views of reality are manipulated. 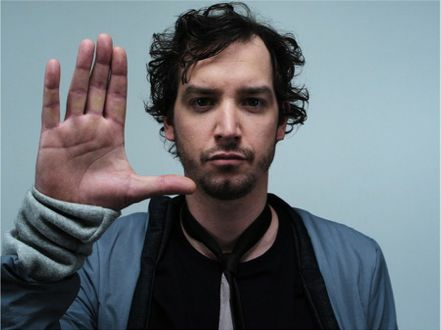 The video was shot at the test facility where Roel's father Rob used to work. Although we filmed about 12 takes with lots of dolly zooming and framing. We decided to use the very last take with no zooming and a fixed camera position. It is a one take, top shot music video with trampoline gymnasts simulating typical video effects. 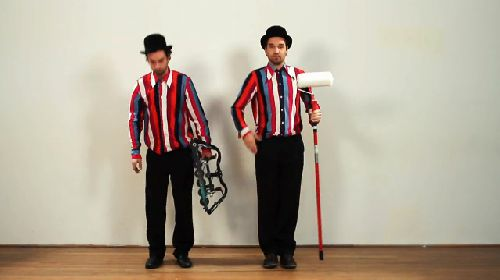 The project was commissioned by the TAX-videoclipfonds. 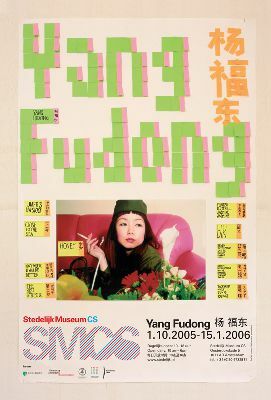 The important criteria were that the audience at the opening would be able to witness the whole shoot, and that the video could be added to the exhibition immediately after the shoot. This meant we had no option to reshoot or edit if something went wrong. This made the whole crew so focussed that we performed even better than any of us could have imagined. The video has won 'The Best Music Video Award' at Festival du clip in Lille, France. A Interactive monument for the victims of the flood of 1953. based in Watersnoodmuseum in Ouwerkerk. The project started in 2001 at a workshop of the mediafonds at the Sandberg Institute and was opened on 23 april 2009 by prime minister J.P. Balkenende. The project is based at a special location namely inside one of the caissons, huge concrete constructions used to close the broken dykes. It is a collection of memories about the victims of the flood. These oral memories are triggered vocally by speaking out loud a name of one of the victims. 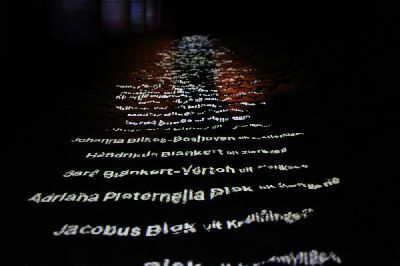 The names of the victims are projected on the sand. We created a mini site in order to collect these memories. In collaboration with Koert Davidse (Serious Film) and Omroep Zeeland. With the generous help of Stimuleringsfonds Nederlandse Culturele Omroepproducties, Prins Bernard Fonds, VSB fonds, DRV Accountants en belastingadviseur, Scansoft, Scoop, Zeeuws Archief, Zeelandnet, Submarine. Because of its big size the poster is designed in the same size as it is printed. 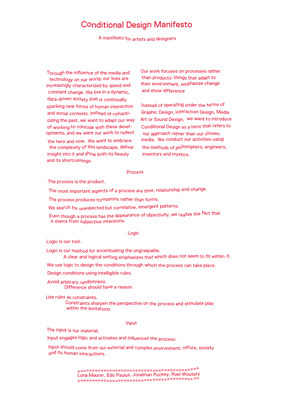 Taken from an article in Graphic Magazine 17 "WHEN DESIGN BECOMES ATTITUDE"
Conditional Design is a tight knit collaboration that we have had since many years and formalized in 2008 through weekly meetings at the kitchen table of Luna Maurer. During the first half year we worked on a manifesto, which could act as a framework for our meetings and discussions. It was also important to us that this manifesto would be shared with the outside world and could therefore also be discussed and critiqued outside of our personal surroundings. Instead of defining ourselves by the medium that we work in, we wanted to create a term that would describe our approach to our work. Conditional Design puts a focus on processes rather than products: things that adapt to their environment, emphasize change and show difference. Usually our individual design practices are very result orientated. 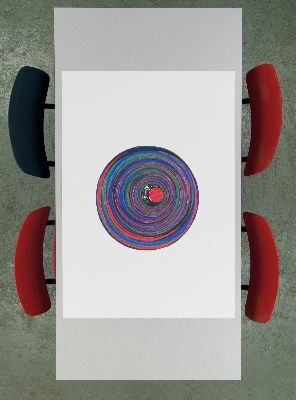 Our meetings are a place to test and discuss assumptions and unfinished ideas. After completing the manifesto, we started doing a series of weekly workshops, where each week one of us would come up with a plan for the evening. We created a camera setup above Luna’s kitchen table, with which we could easily document the workshops and share them online. This is an exercise without aim, but which carries as main idea the fact that it is possible to change daily habits. Singular letters form words and these become sentences. It is about simple instructions, neither radical nor political minded, which everybody can try, because they are taken out of daily life. This are small thought-provoking impulses, which allow to make aware everyday life, place, origin to the point of indentity to reconsider and reflect these issues. The ten sentences are exemplary and can be continued indefinitely. Because in a land where everybody is conscious of its beauty as well as traditions and culture are intensivly cultivated/maintained, fear of loosing them is predominating. That leads to an increasing, ostentating acting out of identity, which is often, seen by distance, perceived as constrained ridgidity. With this exercise fear from the loss of identity and cultural heritage shall be taken away and people shall be invited to think within different perspectives. 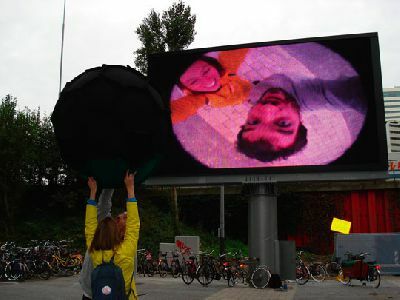 Jubilator was first performed in October 2007 during the opening event of the new big screen CAS Zuidas in Amsterdam. Around 500 people witnessed the unique moment when Jubliator was first launched. Jubilator is a ball of 120 cm diameter with a wireless built in camera and microphone. The image that is captured by the ball is live projected on the screen in front of the crowd. Jubilator's name is lend from the verb 'jubilate': show great happiness, rejoice. By throwing the ball up high in the air, letting it drop to the ground, passing it on from person to person, holding your face in front of it or just by everyone reaching their arms far out, the most divers and spectacular images emerge. By watching the screen you can directly see the results of your own interactions with jubliator: while observing the crowd you suddenly see close-ups of faces, hands, arms and other body parts and together with this image you hear the emplified jubilating sounds people make by interacting with the ball. But Jubilator also brings the spacial surrounding into new perspectives. Due to the camera's lens, the ball's movements, it's spinning and the dynamics of bouncing, everything - people, houses, ground and sky - becomes an actor in the crazy ride through space and time. For Jubilators website click here. Quotes are reflecting on the theme. Themes were: Politics & Freedom of speech, The way dutch media created an image of Slobodan Miloscevic, invisibility in the media. Living archive is an installation in the dunes, a nature reserve, in The Netherlands (map). 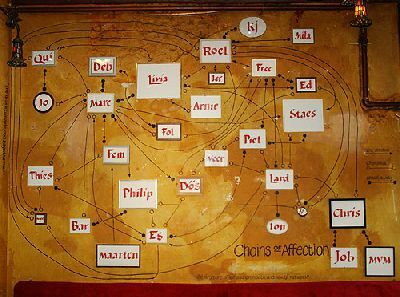 During the year of 2009 everyone is invited to manifest him- or herself in the spirit of Jan Wolkers, a famous Dutch artist and author who died in 2007. A camera records everything that moves within a specific marked area by movement detection. 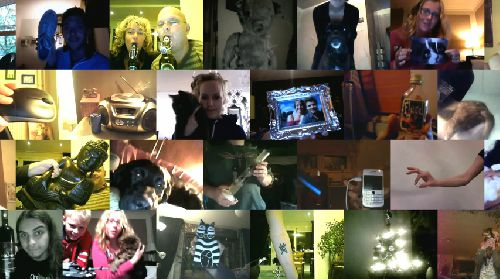 The fragments generate a big archive of accidental video material, nature observations, animals passing the marked area as well as intentional material by people performing in front of the camera. Nature and culture melt in the digital archive levendarchief.nlOn the website people can see all the recorded fragments and drag their favourites in the timeline on top. The timeline creates a movie that can be edited by everyone. This collaborative and constantly changing movie is simultaneously projected in the museum. 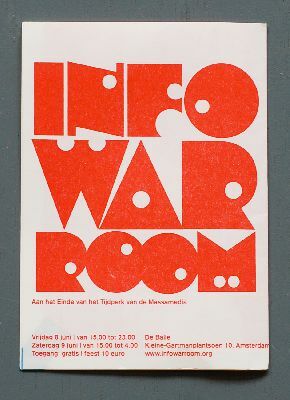 The documentation images show the website, the location with the camera pal, stills of the video fragments, the promotion brochure and the 'new year card' of the Stedelijk Museum De Lakenhal. In collaboration with Luna Maurer. 4 different colors pen: red (Jonathan), green (Roel), blue (Luna), black (Edo). 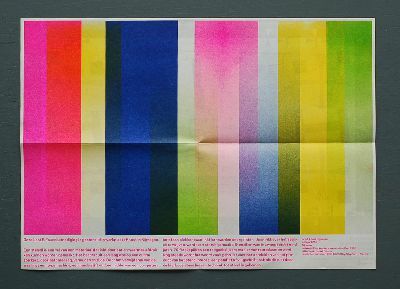 Since spring 2008 we (Luna Maurer, Edo Paulus, Jonathan Puckey and Roel Wouters) come together every tuesday at Luna's kitchen table. Aside from working on the Conditional Design Manifesto we organize weekly Conditional Design workshops and publish the results on our Conditional Design website. These posters are also one of the results of these workshops. For the posters, every week one of us had to define the rules that we will execute during one evening. We never know exactly how the patterns will emerge. Sometimes, the patterns are complex and the rules are simple and sometimes the patterns are simple and the rules as well. Trailer for the first edition of International Film Festival Breda. A silver sphere on an endless checkerboard floor is the default for many 3D modeling applications. It can be seen as an icon for a sterile, makeable world. Reality though, is dirty and unpredictable. By recreating this icon in reality the beauty and imperfection of real life gets emphasized. The recording was the result of 3 people controlling different parts of the installation, Roel controlled the speed of the balls, Benoit (Eurogrip) controlled the speed of the dolly and Sal focussed and zoomed the camera. It turned out to be a play were the 3 of us playing harmoniously together. Job and Gradus both are very ambitious concerning letters. 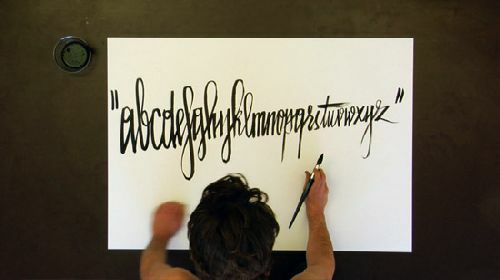 Spontanious jam sessions in our studio inspired us to make this video about the fun of drawing letters. This project was commissioned by Creative Review & Sony. Record sleeve and promotional material and for Kopna Kopna (dutch popband). 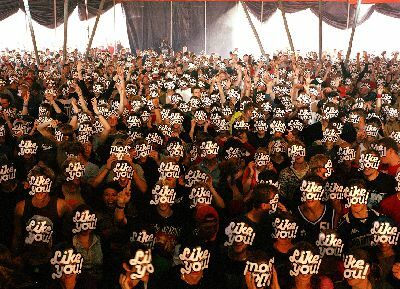 In order to shoot the crowd, we gave away 2000 masks to the audience during a show at Lowlands. Frontman Rik asked his fans to put up the masks, then Thomas and Roel jumped on stage to shoot the crowd. 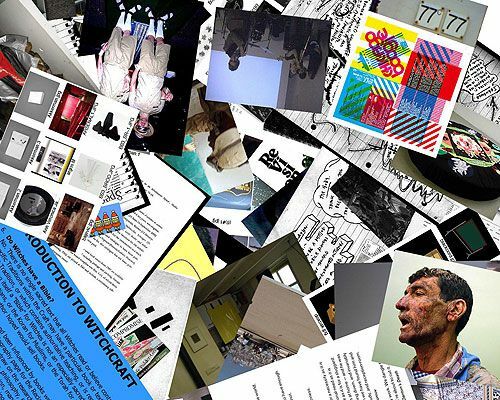 We commissioned visual contributions to ...and Beyond, Denny Backhaus, Erik Borra, BoyPlayGirl, Uta Eisenreich, Marc Faasse, Timo Hoffmeijer, Karst-Janneke Rogaar, Tunc Topcuoglu, Simon Wald-Lasowski. 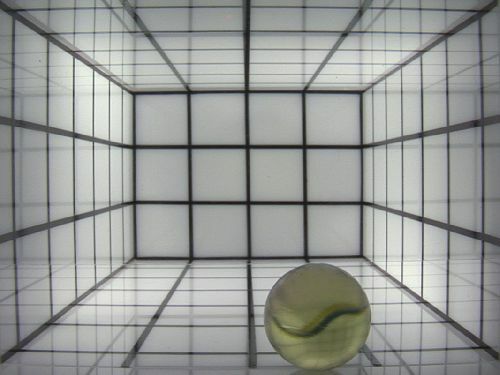 Sally is a short film that shows marbles in a room. The gravitation of the room is variable therefore the marbles will dance over the floor, walls and ceiling. In June 2004 the pulllovers were presented at the exhibition "10 years Design Sandberg Institute" at Post CS, Amsterdam. 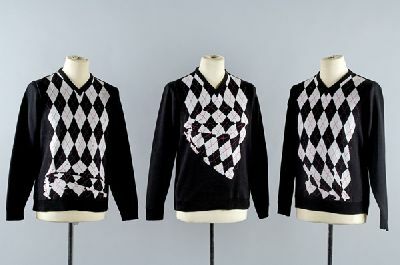 The Argyle Pullovers were knitted at the Textile Museum, Tilburg, with a digital knitting technique. inspired by this research of James Moody. It's theme was 'wireless'. During the performance we carried a fan on to the stage and placed it in front of the computer-screen. 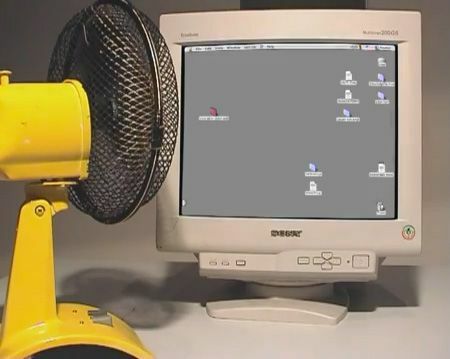 The fan accelerates until it blows away the entire desktop. The installation is a trash-can filled with the digital trash from the computers of the exhibition's participants. Thank you: Karst-Janneke Rogaar, Rob Schroder. Every month i invited a friend in my studio to hand draw a portrait of the Dj playing that night. 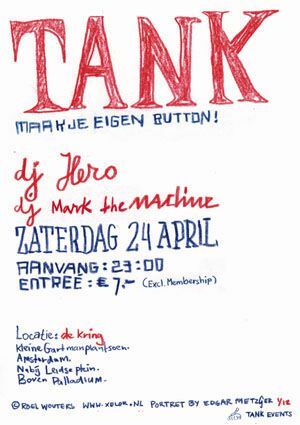 While my friend was drawing the DJ we played music, drank a beer and i was drawing the other, informative side of the flyer. 12 of these flyers have been made.